The Selection by Kiera Cass and Confessions of a Murder Suspect by James Patterson and Maxine Paetro. I loved Nomi's reviews so much, I picked up a copy of The Selection for myself! Chasing the Dark by Sam Hepburn and Tiger Lily by Jodi Lyn Anderson. I was lucky enough to get a copy of Chasing the Dark (which comes out June 3rd!) for review from the Book Depository. It was quite good, guys! I read Tiger Lily earlier this year, but my review waited in my drafts for a while. Ahem. Slacker! Glad I was able to finally get it posted, though. I didn't read any books for the TBR Pile Reading Challenge... but I am ahead! I made the goal of reading 10 books for the year and I've already read 9! I was also able to link up my first review for the challenge, so that's awesome. One month of semi-slacking isn't too bad, right? 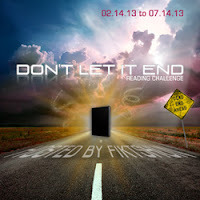 I still have yet to read any books for the Don't Let it End Challenge. I don't know what's wrong with me! I just can't seem to let some of these series go! Well, that and I have so many other books I'm reading. Sometimes I wish I could speed read or something... almost. As I mentioned before, Chasing the Dark was a review ARC I received from the Book Depository. Scarlet was the pick for a read-along I did with my friend Jen over at Literally Jen. I really enjoyed it and I hope to have a review up before too long! I like when I get to do read-alongs with people. It helps all of us get through our immense TBR piles! Too bad Scarlet was too new to count towards my TBR Pile Reading Challenge. Oh well. So that's what's been going on with us here at She Dreams in Fiction. Maybe next time Nomi will be able to share her reading progress with us as well! Ahem. Hee hee! Well... I think that's all for this month's wrap-up. I wish you all the best bookish dreams!